To plug in or not plug in, that is the question?when it comes to many of today?s hybrids. Kia moved into the hybrid crossover segment last year in direct competition with the giant of the hybrid market, the Toyota Prius. And Niro racked up impressive sales the first year selling 27,237 in the face of the stiff competition not only from the Prius, but the Ford C-Max, Hyundai Ioniq and other new arrivals. It?s easy to see why Niro did well. 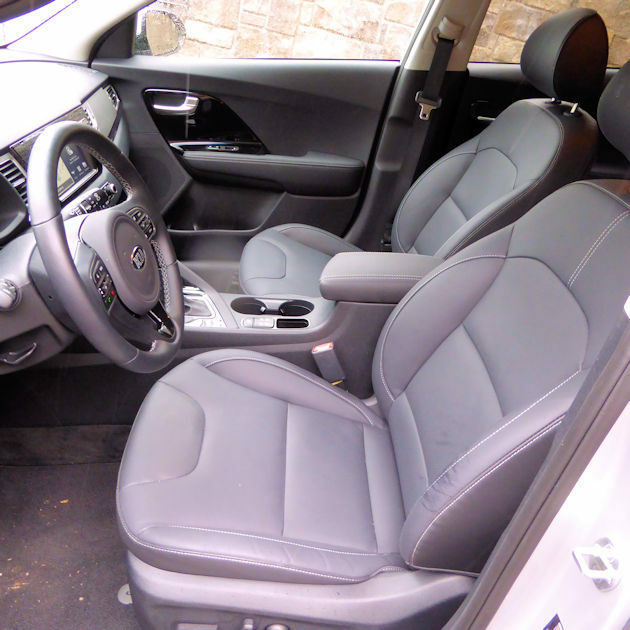 The design is fresh, fuel economy is impressive, it has a spacious interior and it?s fun to drive. By the end of the 2017, Kia also added a plug-in hybrid version of the Niro. 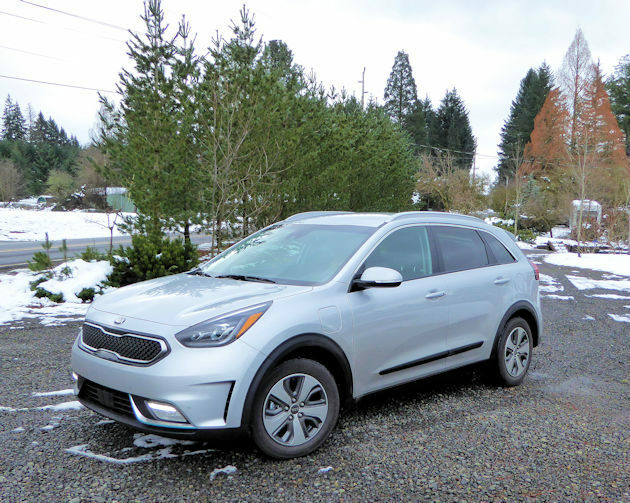 The 2018 Kia Niro PHEV (plug-in hybrid) comes in three trim levels: LX, EX and EX Premium, with the base prices at $28,840, $32,440 and $35,440 respectively, including the destination charge. 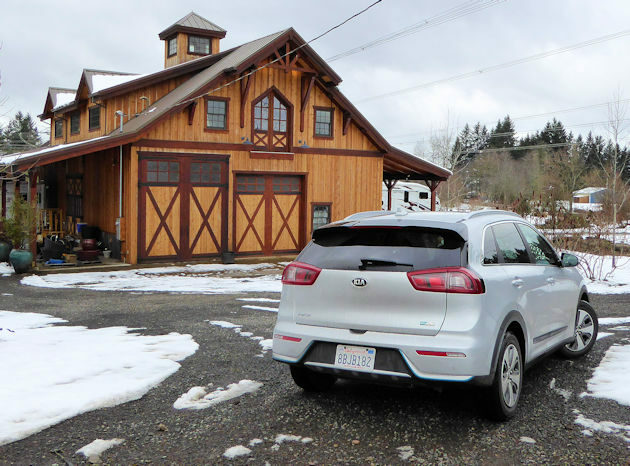 The Niro is the third Kia plug-in model following the larger Optima sedan Plug-In Hybrid and the all-electric Soul EV. The Niro?s 8.9kW lithium-polymer battery pack can receive a full charge in about nine hours at home using a standard 120V outlet or at a commercial 240V charger in about 2.5 hours. 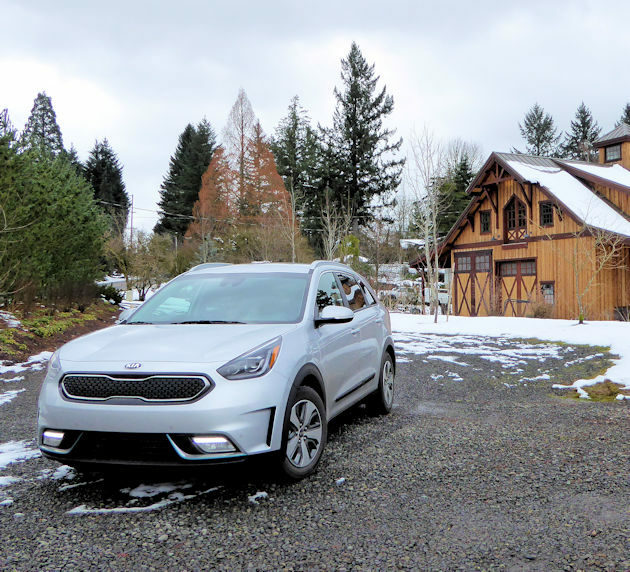 When fully charged, the Niro has an electric-only range of up 26 miles depending on the type of driving and the conditions. The Niro?s 60-hp electric motor is a mated with a 104-hp all-aluminum 1.6-liter gasoline engine. The direct injection engine is a DOHC Atkinson design and drives the front wheels. 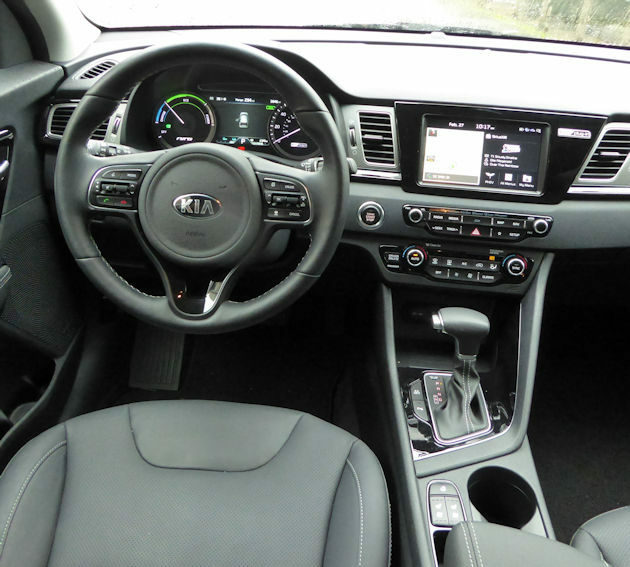 The Niro uses a six-speed Dual Clutch Transmission, which we consider to be big plus over the CVT (continuously variable transmissions) used in most hybrids. When the battery runs low, or the driving conditions warrant the need, a gasoline engine starts and takes over or the pair runs in tandem to provide more power, for acceleration, passing or hills. Drivers can choose from EV mode, Hybrid mode, (default) Eco mode, or Sport mode for quicker transmission response to maximize performance or economy. The combination powertrain produces a respectable 8.7 second 0 to 60 mph acceleration time according to buff magazine tests. EPA fuel economy estimates a combined MPGe (miles per gallon equivalent) of 105 mpg with a range of 560 miles. The gasoline-only rating is 48 mpg city, 44 mpg highway and 46 mpg combined. We averaged 45.5 mpg according to the trip computer after a week of testing. At 171.5 inches long, the Niro is about 11 inches shorter than the Prius, but it has more than 10 percent more passenger volume. In addition, the Niro is 21 inches shorter than the new 2018 Honda Clarity Plug-in, but it has about the same passenger volume ? 100.9 cubic feet. 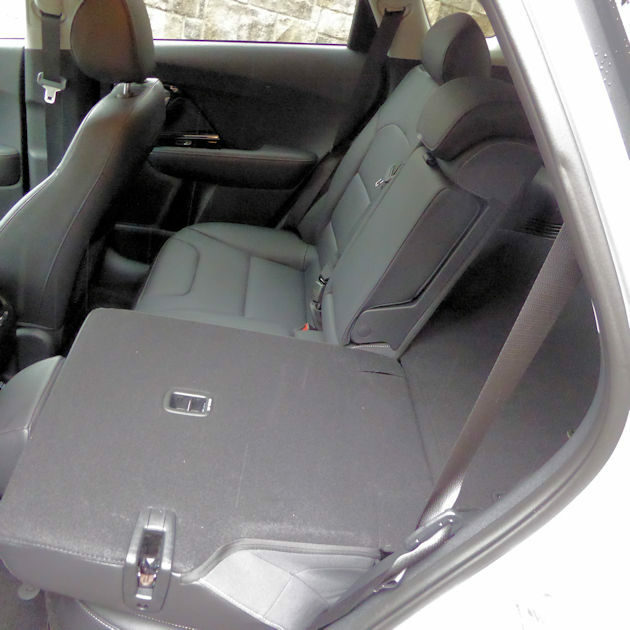 With the four-door hatchback configuration, the Niro allows the owner to tailor cargo/passenger needs. Using an aluminum hood, rear liftgate and several suspension components, engineers were able to keep the weight down to 3,391 pounds making it one of the lightest plug-in hybrids in the category and to produce balanced handling characteristics. Much of the advanced technology that was only found in higher-end vehicles a year or two ago has filtered down to vehicles like the Niro. Our EX Premium test vehicle standard equipment list included features like LED headlights, power folding side mirrors and eight-inch touch screen navigation. Safety equipment includes rear camera, autonomous emergency braking, forward collision warning system, lane keep assist, smart cruise control, blind spot detection, lane change assist, rear cross traffic alert and front and rear park assist. 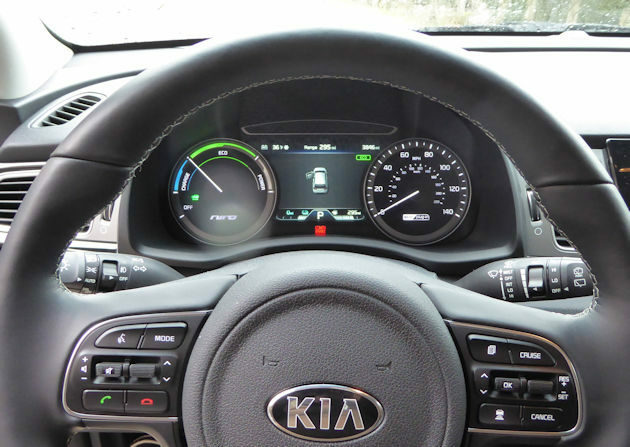 The comfort and luxury enhancements include heated and ventilated (front) leather seating, heated steering wheel, infotainment system with Apple Car Play and Android Auto, satellite radio, HD radio and Bluetooth. 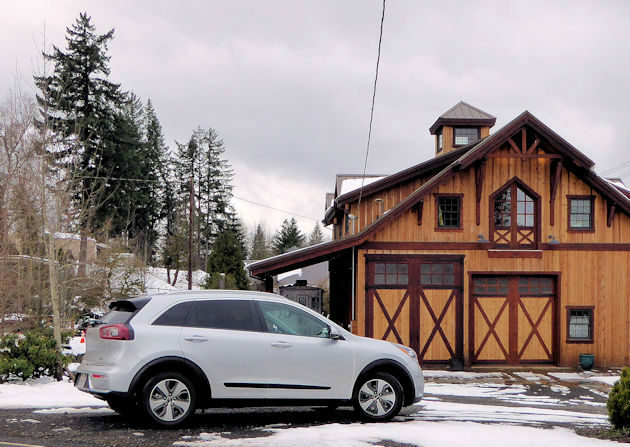 The 2018 Kia Niro PHEV has a strong universal appeal. A commuter or local errand runner gets the benefit of the all-electric operation without the range anxiety associated with pure electric models. 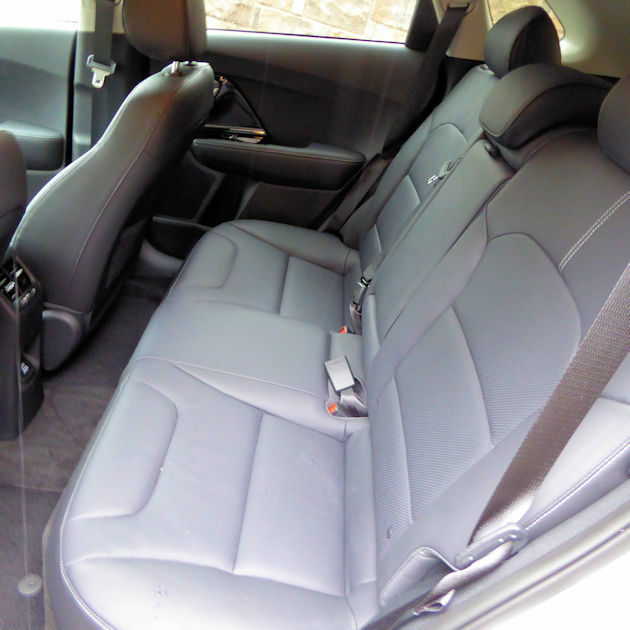 This is a small car that we found comfortable enough to use for a road trip, and with a range of 560 miles. We think the Kid Niro Plug-In is an excellent choice when shopping for a new practical and economical car.